OB: 12.07.99 Died tragically, doing what he loved, 1st June 2014. First bike was a JR50, then a CRF50, KTM50, RM65, small wheel RM85, big wheel RM85, Suzuki 125, and lastly Suzuki 250. Bike # 323. Aims: Do well at Woodville and the Nationals. Favourite Riders: Cody Cooper & Kayne Lamont. Sponsors: Koromiko Engineering, MotoCity, Power Balance NZ, Elf Oils, Mum & Dad. Click here Trent's facebook page or here Trent Tribute Page to leave or read the tributes. MOTOCROSS DEATH: Trent Haywood, 14, died after crashing in a motocross race in Waipara, North Canterbury. Trent Haywood's father was supposed to return home with his triumphant son brandishing yet another motocross accolade. Instead, Derek Haywood yesterday arrived back in Tauranga with just his son's trophy. Fourteen-year-old Trent was killed on Saturday after launching off a 30-metre jump at the Godfrey Memorial Motocross event at a farm in Waipara, North Canterbury. He was running second in the race and was first overall in the junior 14-16, 250cc event going into it. The event was cancelled after the accident, leaving the popular teen to claim the title posthumously. The prizemoney for the cancelled races would be donated to the family. Speaking from her Tauranga home, Deanna Haywood said coming to terms with the loss of her son would be a "long process". "Trent was just so humble and just a man of few words. I know it sounds a bit silly but he was just the perfect child," she said. Trent had taken up motocross when he was 5 years old. From the moment he tried he was "into it every weekend". "That was his life, he didn't want anything else. But he really did have to work at it," Haywood said. "We knew we had to support him 100 per cent." While the gifted youngster seemed to dominate motocross events with ease for most of his budding career, he had done so against the odds. Trent suffered undiagnosed health issues from birth, with his condition being treated as sports-induced asthma for the first decade of his life. It was not until he nearly collapsed during a race, when he was 11, that an ambulance officer suggested he be tested for supraventricular tachycardia - a condition that causes the heart to beat abnormally fast. "His heart would just go up to 200 beats a minute," Haywood said. "We were completely shocked after all that time to find out then that he had a heart disease." He underwent major heart surgery in 2012. The surgery fixed his heart, but he continued to suffer from "drop attacks". He continued to see a physiotherapist for the breathing problems which accompanied his heart condition. But Trent would still not give up motocross. "That was it after that - I could never watch his races, I was too nerve-racked. "I was always apprehensive, but I loved the fact that he loved it so much." The attacks sometimes occurred during racing but he assured his mother he had "a couple of seconds warning" before they happened. Haywood said while they do not know what caused her son to crash on Saturday, she had been told it was unlikely to have been related to his heart condition. Trent's involvement with the motocross community gave him the confidence and friends he had struggled to find, she said. His girlfriend of six months, Georgia Edwards, was also a motocross rider. Haywood said her husband and Trent's brother Brad, 13, who both accompanied him to most events, would be "completely lost" without him. In a cruel twist of fate, the last thing Haywood can recall saying to her son is light-heartedly reminding him about a text from his racing mentor. "He had said ‘If you're not comfortable, you've got to go back a notch even if it's costing you a place'. Trent just turned around to me and he said ‘You really think I'm going to button off'?" She believed he would have followed his passion to take on the sport professionally. Tauranga Boys' College principal Robert Mangan said the year 10 student was well-liked and would be missed by teachers, staff and students alike. 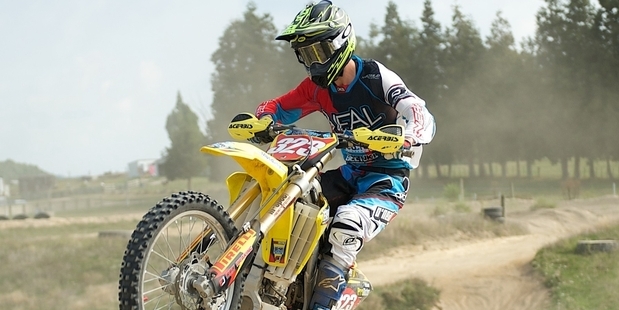 Trent had recently led Tauranga Boys' College to victory in a local Waikato motocross event. "He was a good student. He did all that was expected of him in the classroom but ultimately he lived for motocross." The father of a Tauranga teen killed during a motocross race urged organisers to carry on with the event after his son's death, telling them it's "what he would have wanted". Tauranga Boys' College student Trent Haywood, 14, died while competing in the Michael Godfrey MX Memorial in Omihi, near Waipara in north Canterbury on Sunday morning. Police said the teen suffered head injuries when came off his bike on a 30m jump about 11am. Motorcycle NZ president Jim Tuckerman said organisers shut the event down after the teen's death, despite Trent's father Derek telling them to carry on. "Trent loved this sport with all his heart, so much so that his father asked organisers of the event to carry on after his death. He told them that's what he [Trent] would have wanted but they decided they had gone through enough races so they stopped." Mr Tuckerman said he wished he could "shut down social media" after comments calling motocross dangerous following the accident. "There are people saying kids should not be on motorbikes but that is just rubbish and hurtful to the family," he said. "Safety is always at the top of our minds and we are always reviewing our sport to make it as safe as possible." Mr Tuckerman said Motorcycling NZ was helping with the police investigation and would run an independent investigation of its own. "It would appear so far that the organisers did everything by the book," he said. "Trent was a very, very good rider, he had heaps of potential and this is a classic example of what we in the industry call a racing incident. They are always possible, no matter how good you are. The reality is when you throw your leg over a bike you put yourself at risk. "But the reality is people put their lives at risk every day, just by getting out of bed. There is more risk walking across Cameron Rd at 8.30am than there is enjoying this sport." The Haywood family could not be contacted yesterday but a family friend said they were still coming to terms with the loss of their son. "He was too young, much too young," he said. "Everyone is just shocked by this, we are used to the odd broken bone in this sport, a few scratches and bruises but not this. Despite what people think, deaths very rarely happen in this sport and not to a great little rider like Trent. "He was a real talent, could have been an international rider in the future." Shelley Dean, who runs his Maddix Park motocross park in Tauranga, described Trent as a "cool little guy" who was passionate about motocross. "That was all he wanted to do, just ride," she said. Police said all aspects of the incident, including the track, would be investigated. 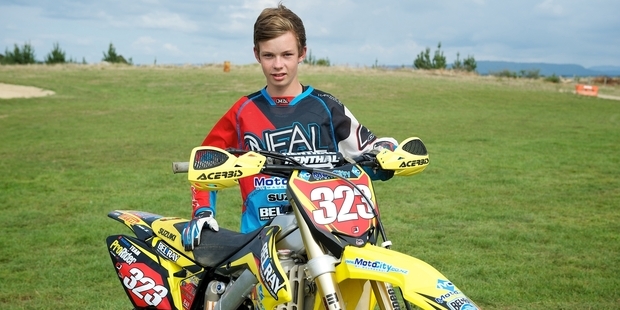 A Tauranga teenager killed at a motocross event in the South Island has been described as a fearless, up and coming champ with an "infectious personality". Fourteen-year-old Tauranga Boys' College student Trent Haywood died while competing in the Michael Godfrey MX Memorial in Omihi, near Waipara yesterday morning. Police said the teen came off his bike on a 30m jump and suffered serious head injuries just before 11am. Officers were unable to say what caused the crash, however, witnesses yesterday raised concerns about the size and shape of the jump, saying they thought it was dangerous. About 100 spectators and racers, including Trent's father and friends, witnessed the crash. Paramedics revived the boy briefly at the scene before he died. A friend of the Haywood family, who asked not to be identified, said Trent "had a lot of potential" and was on track to becoming a successful rider. "He has been riding since he was just a little guy, about 4 or 5," he said. "And he is just awesome, he loves it, motocross is his absolute passion. "He has had a lot of success regionally and was starting to enjoy the rewards of hard work. "This is just tragic. He was far too young but I can't help thinking he was doing what he loved and that is a lesson for all of us in life. Spend your time doing something you are passionate about." Another friend of the family said Trent's personality and passion were "infectious". "You couldn't help but smile when he was around and going on about motocross," she said. "He was really positive, really fun and this is a huge tragedy for the family and his motocross family. We are all in shock. He is going to be sorely missed." The event was cancelled after Trent died and the teen was later named a champion, coming first equal with another rider due to his points tally. Nikki Shelley, secretary of Christchurch Offroad Motorcycle Club, which ran the event declined to comment yesterday "out of respect for the family". The motocross community was yesterday in shock, with hundreds of people posting on Trent's Facebook page saying they could not believe he was gone. "R.I.P bro still can't believe that you are gone. Such a good friend and had some good times with you. Ride in peace," one person wrote. Videos of the talented young rider were shared, along with memories of his recent wins, including the recent MotoX in the Maize competition, where he took home the top competitive 250cc title. The teen was also one of four taking part in the Team Moto City Bel-Ray Junior Development team and had several sponsors. Sergeant Rob Irvine, of Kaiapoi police, said Trent's death was believed to be the first in the event's 35-year history. The weather was fine and the track was largely dry, he said. Click here for Andy McGechan's report. Click here for Trent's facebook page to leave or read the tributes.